One of the pleasures of creating a website like Nights in the Past is the voyage of historical discovery which frequently reveals somewhere you would never have known existed otherwise. Hadley Bowling Green Inn is one of those very places. For some, the fact that the building stands alongside the oldest bowling green in the entire country will be of significant interest. However, for most it will be its very probable connection to the Gunpowder Plot. Indeed, it was here in the summer of 1604 that Guido Fawkes (better known as ‘Guy’) is said to have spent a considerable amount of time - possibly with co-conspirators. Whether the true mastermind behind the plot, Robert Catesby, was present we shall never know. 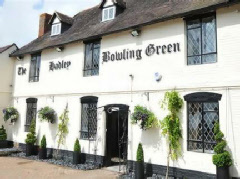 Today, the Grade II listed Hadley Bowling Green Inn features 9 guest bedrooms, including doubles, twins and family rooms. The M5 motorway is just a few miles away, as is the historic city of Worcester.